Sabancı University became the Turkish private university with the highest position upon span4 entry to the rankings. 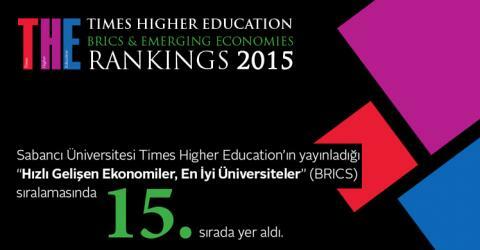 Sabancı University entered the Times Higher Education (THE) BRICS & Emerging Economies Rankings in 15th position. 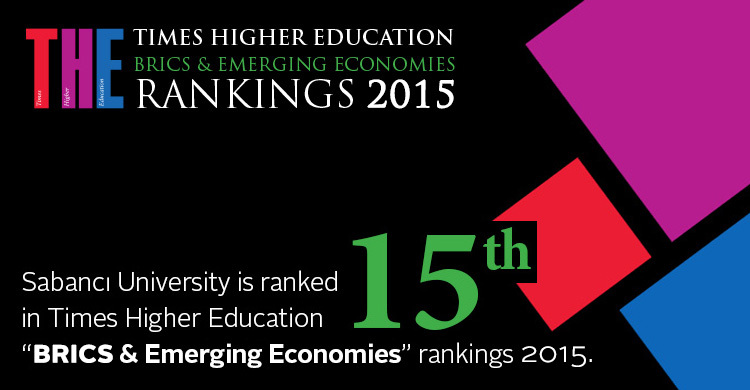 Eight Turkish universities were included in the BRICS & Emerging Economies Rankings. After only 15 academic years since its establishment, Sabancı University entered the rankings in 15th place, and was among a handful of Turkish universities in the top 100: METU (3rd), Boğaziçi (7th), ITU (8th), Bilkent University (19th), Koç University (29th), Istanbul University (51st) and Hacettepe University (82nd). In October, Sabancı University had entered the Times Higher Education (THE) rankings in 182nd position, becoming the Turkish university with the highest position upon span4 entry to the rankings, and was the only private Turkish university to be among the top 200 universities of the world. The Times Higher Education BRICS & Emerging Economies Rankings uses a methodology that covers all core missions of a world-class university - teaching, research, knowledge transfer and international outlook – using 13 carefully calibrated performance indicators. In addition to core missions, the geopolitical positions and economic situations of their home countries also affect their ratings.